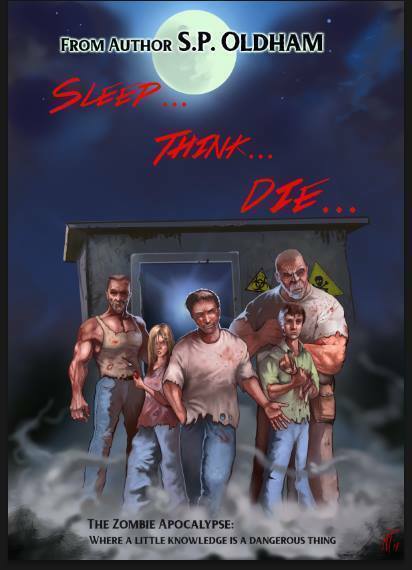 Now that we have a winner I can reveal the fabulous poster designed and created by the very talented Mike Tenebrae and based on the main characters in my book 'Sleep, Think, Die - The Zombie Apocalypse; Where a Little Knowledge is a Dangerous Thing.' If you are looking for an illustrator for your work I can't recommend Mike highly enough. Hope you like the picture as much as I do! As always, I am grateful for honest reviews on Amazon and Goodreads. Treat yourself to a fast-paced zombie read with an original twist for only £1.66 or $1.28. I am 16 reviews away from the 'magic number' of 25 when I believe Amazon starts 'picking up on' your book, so if you buy and enjoy, please review! And here it is in T-shirt form!